Americans love superlatives. We use lots of words that end in -est and we want everything we do and see and own and hear about to be described as the somethingest. It’s natural, then, that -ests have been a big part of this road trip, even when they’re a bit obscure: the oldest minor-league ballpark, the world’s steepest incline, the highest mountain east of the Rockies. 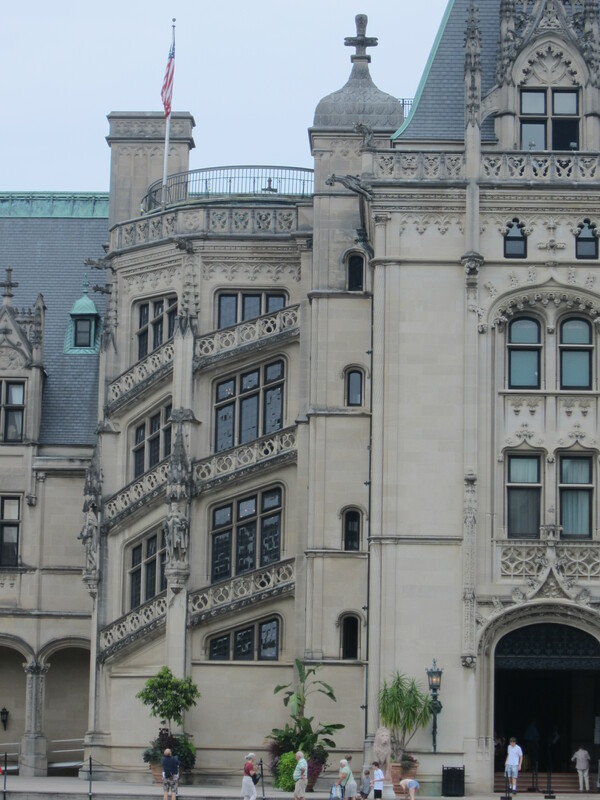 On Friday we took the extremes to an extreme by visiting Biltmore Estate, the country’s biggest private home. This time, however, “biggest” seems like a significant understatement. In American history, it doesn’t get anymore -est than the Vanderbilts, and it was George Vanderbilt (grandson of Cornelius) who lived here. According to our audiotour, he imagined the place as a country house but started thinking bigger. The estate encompasses 125,000 acres. If you’re like me, you’re not good at picturing how big an acre is, so let me help: after we entered the estate, we drove about a quarter-mile to the ticket building. From there we drove three miles to the parking lot. Then we walked about eight minutes from the parking lot to the house itself. After touring the house, we drove another five miles to the part of the estate where the farm and winery are. Let me put it another way: the grounds were designed by famed Central Park architect Frederick Law Olmstead. You could fit 72 Central Parks inside the Biltmore grounds. The house itself, well, the photo above doesn’t do it justice, but nobody’s allowed to take pictures inside. 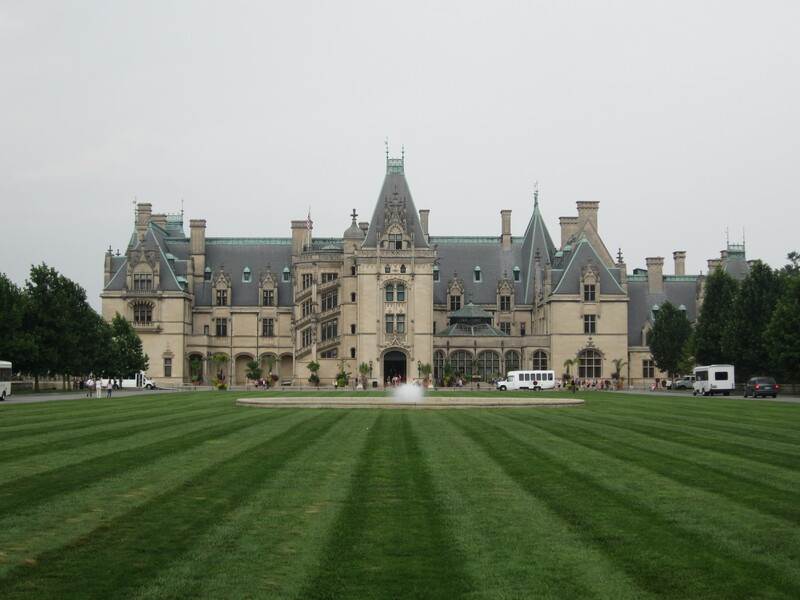 Here’s how the Biltmore website describes it: “4 acres of floor space, 250 rooms, 34 bedrooms, 43 bathrooms, and 65 fireplaces. The basement alone houses a swimming pool, gymnasium and changing rooms, bowling alley, servants’ quarters, kitchens, and more.” And this was in 1895, when even one indoor bathroom was considered extremely schmancy. The house was so big that even the servants had servants. No, seriously, there was actually a kitchenmaid whose job was to serve meals to the full-time staff of 30 before the staff would then go serve the Vanderbilts. But it wasn’t just big, it was beautiful to an extreme. Sam, who still frequently uses his shirt as a napkin, described it as “elegant.” It’s like the anti-Graceland; I wish Elvis had seen this place before he started decorating. Sam and I couldn’t decide which part of the house we loved more. Maybe it was the main dining room, with its seven-story ceiling, its three massive fireplaces, its massive pipe organ, and its seating for 43. Maybe the two-story library, with its 20,000+ plus books, its incredible spiral staircase up to the second level, its secret door to another part of the house, and its chess set and game table that had been owned by Napoleon. Maybe the grand staircase, four stories of cantilevered limestone slabs holding each other in place as they wrap around chandelier after chandelier, surrounded by windows showing off the breathtaking estate. In fact, the house was so big that even the staircase had its own staircase. No, seriously, built into the stone walls at three levels of the grand staircase were wooden doors that led to a narrow outdoor staircase terrace that wrapped around the outside of the indoor staircase. Just walking through the 44 rooms we were allowed to see was exhausting, so we decided to drive through the gardens instead of walking. 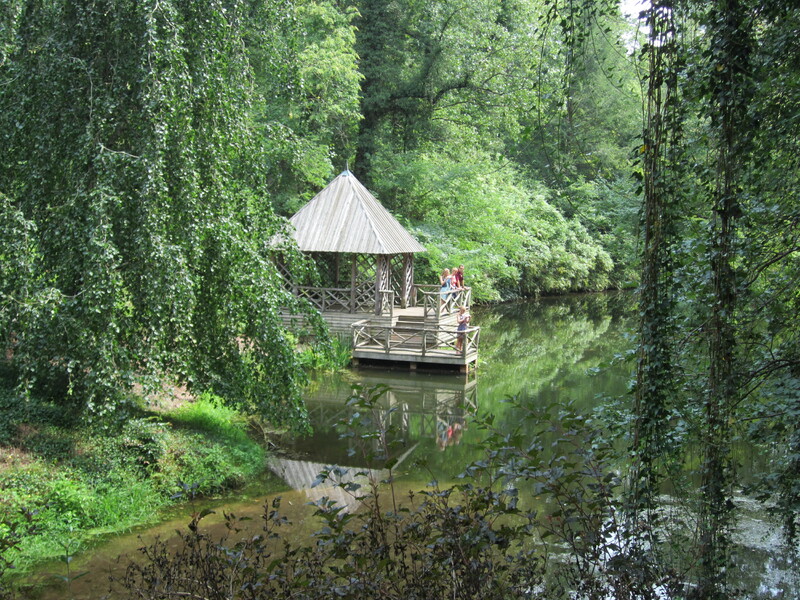 We did get out of the car, though, to wander around the bass pond and enjoy its waterfall and boathouse. 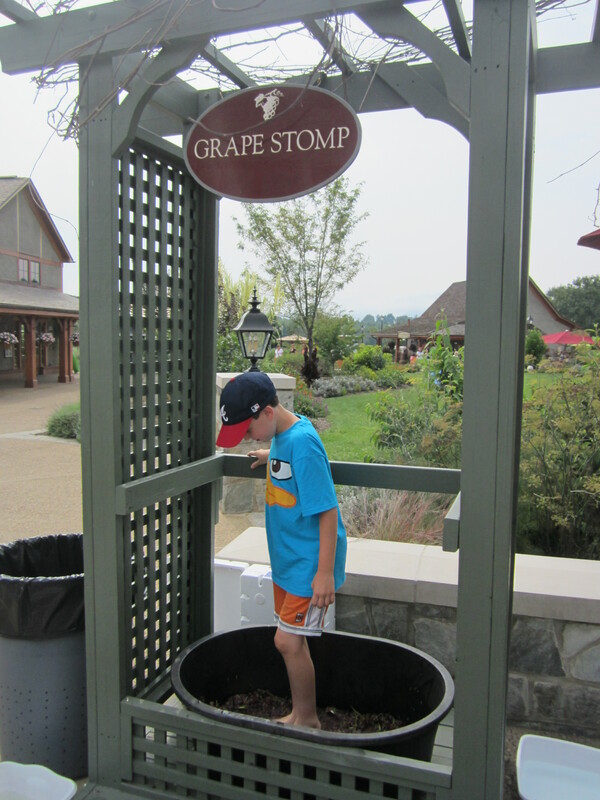 After about 10 minutes of driving we finally made it to the winery, where we couldn’t participate in the free tastings but we did get to stomp some grapes in a big vat. It felt squishy and slimy and very slippery, and suddenly that famous episode of I Love Lucy seemed a lot more realistic. When we left, it took another 10 minutes just to drive out of the estate. By this time it was after 4:30 pm, and we still had more than three hours until shabbos–plenty of time for another activity if we wanted to squeeze one in. But we knew that somehow nothing would compare to George Vanderbilt’s extraordinary house. Sure, there are other things to do in Asheville, North Carolina, but none of them are the biggest.